9 ways to prepare yourself for life after college! College was literally the best 4 years of my life! I learned so much during my time at Hampton University, inside and outside of the classroom. There were amazing days and even those not so amazing days, but I wouldn’t trade my experience for anything. It’s been about a year and 4 months since I finished my degree and I must say that life after college is a totally different ball game! Therefore, preparing for it now can potentially save you a whole lot of stress after graduation day! 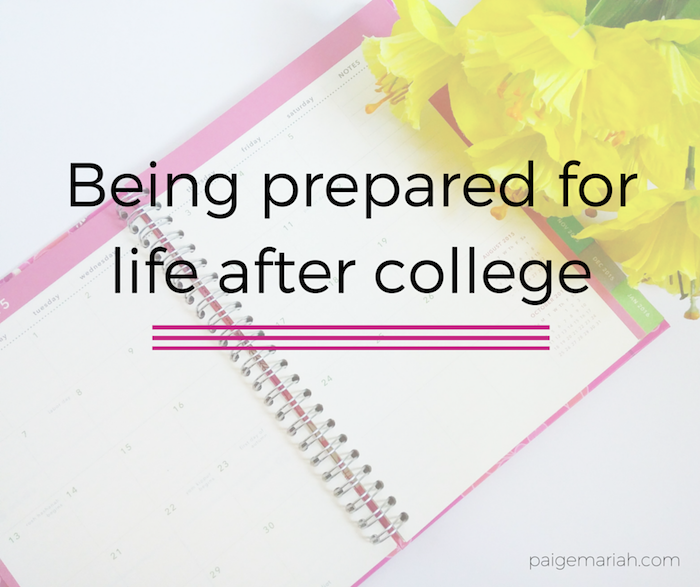 As many college students are returning back to campus, I thought I’d share 9 things that you can do as a college student to prepare yourself for the adult life! Intern, intern, intern: This is always my #1 piece of advice for any college student that reaches out to me. I truly believe that every single college student should intern, no matter the major. Having this experience will help you to better understand what you do and don’t want out of a career. You’ll also have the opportunity to network and learn from people who already have the job that you want. Most importantly, it looks great on your resume! Though I had only been out of college for a few months, because of my strong list of internships, I was able to secure my current marketing job that required 2-3 years of experience. Practice smart spending/saving habits: Goodness. You may think that you have spending/saving down pact when you’re in college, but you may be in for a rude awakening after college! Make smart decisions when spending while you’re still in school and even try to build a little bit of savings. You don’t know how long it will take to secure full time employment after graduation, so having some money to hold you over can definitely ease some of the worry that you’ll already be experiencing. Stay connected with your mentor: If you had the opportunity to become close with a professor, internship supervisor or even an older student while in school, keep that connection tight. If someone is willing to take the time out of their busy schedule to be a mentor and consistently provide you with free advice about things that they’ve already experienced...take advantage. Mentors are here to help! You never know when you might need a letter of recommendation, job referral or advice about your career. Have a summer after graduation plan: This is for my current college seniors out there. Before you know it, it will be graduation day! Now summer time has arrived.. do you plan to intern, begin working full time or enroll in graduate school? Start thinking about these big decisions now. This will allow you more time to have fun and celebrate during your last weeks of college instead of freaking out about the “what now?" Get rid of bad habits: Procrastination, lateness…we all have habits that we know we should let go. Procrastination was my biggest issue in school. I always tried to convince myself that I worked better under stress anyways….uh no. After interning and then beginning my career, I quickly realized that I couldn’t just put things off and wait until the last minute if I really wanted to provide my best work. Just say goodbye to those bad habits now, your future self will thank you! Protect your personal brand: I had a lot of fun in college and I definitely encourage enjoying these awesome years while you can. However, you can definitely have a good time without making decisions that are damaging to your reputation. Though college is only lasts for a few years, the choices that you make now have the potential to follow you forever. You never know, someone who knows you as hardworking and collaborative right now just may think of you in the future when they recommend you for your dream position. You are your own brand, so market yourself in a way that wouldn’t mind referring back to in your 30s! Keep a positive friend circle around you: Your tribe in college is everything! They have the potential to make your college years some of the best or the worst. Keep good people around that not only contribute to you having a good time but help you stay motivated! There are enough things that you’ll have to stress over, endless drama doesn’t need to be one of them. Work on healthy eating/fitness habits: Be very mindful of how you treat your body while you’re in college. As my mother always says, “Treat your current body exactly how you want it to look in 10 years.” If you’re eating fast food everyday and are rarely active, just imagine how you may look in your 30s once your body changes and your metabolism begins to slow down! Have fun! : College has the potential to be some of the best years of your life. Embrace it, take risks, and have fun! There are actually quite a few things that I would go back and do over in college..chances that I would have taken. This is a special time before real life and responsibilities actually hit you, so take advantage and just have a good time! These are great tips, especially interning! It's so important! This post is great! Especially since I'm entering my senior year currently. Thank you!!! !